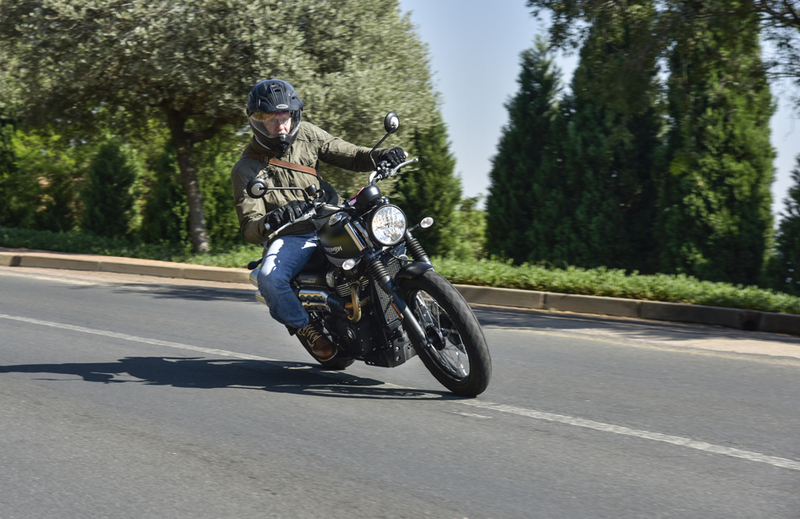 You will recall that I really enjoyed the first version of Triumph’s Street Scrambler. 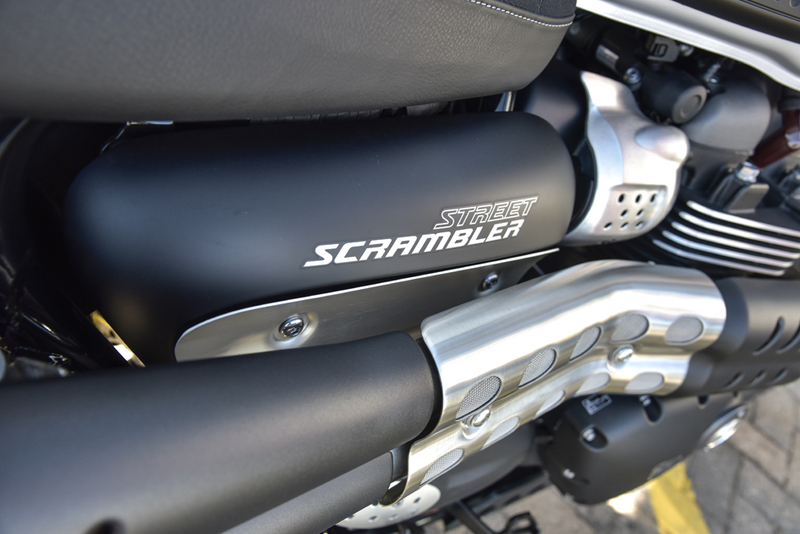 I owned the original Scrambler and really enjoyed it. 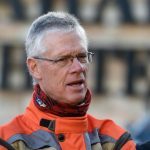 I imported cartridge inserts for the front forks and had rear shocks valved and sprung for me by Works Performance in the States. 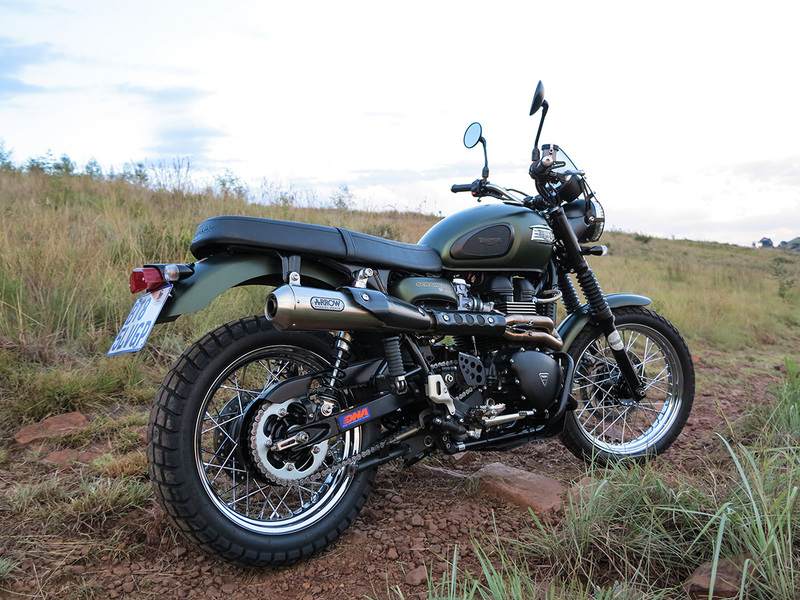 I rode it extensively as an adventure bike doing a “Parys to De Aar” adventure rally as well as Baviaans kloof. 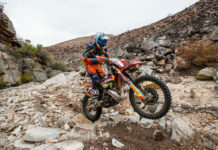 It did not have a lot of suspension travel, but what it had was excellent quality. It was huge fun to ride with a gentle torquey power delivery. 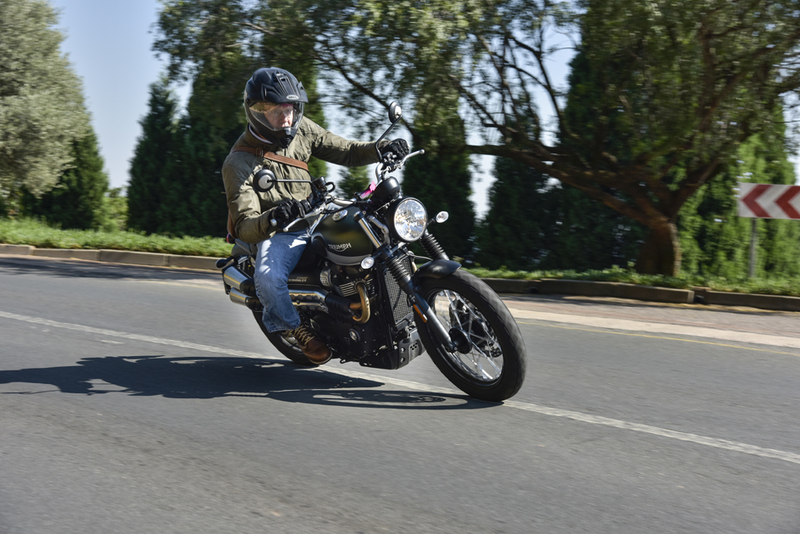 The taut suspension made slides and rear wheel steering almost intuitive. 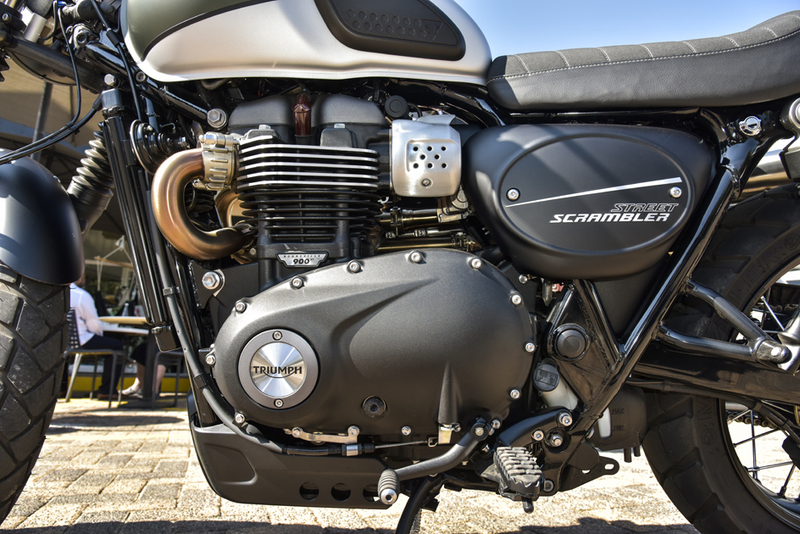 When Triumph introduced there new generation Street Scrambler with much more torque but a tad less power, they also pared around 20kg’s of weight off the bike. 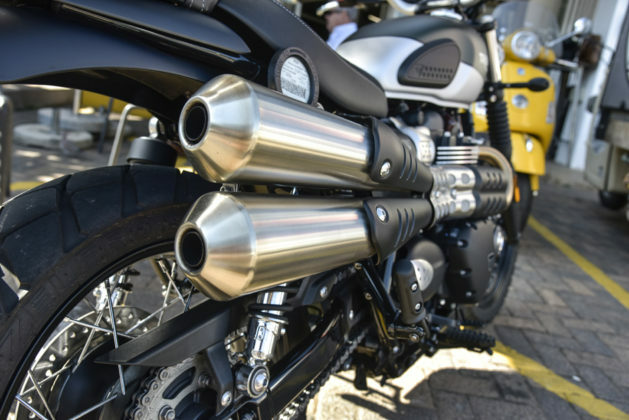 A set of longer travel piggyback Fox shocks were available from Triumph’s accessory catalogue. I lost no time in reviewing the bike and enjoyed it so much that I promptly bought one! 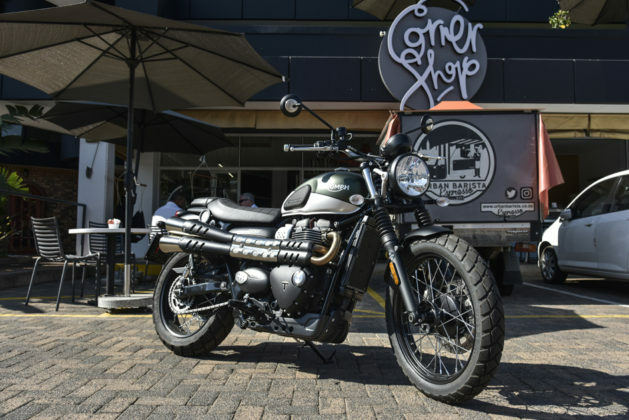 The Triumph Street Scrambler marches totally and completely to it’s own drumbeat. There was general criticism that it had lost some power, but most felt that it was a nicer bike to ride due to the high torque at low revs. 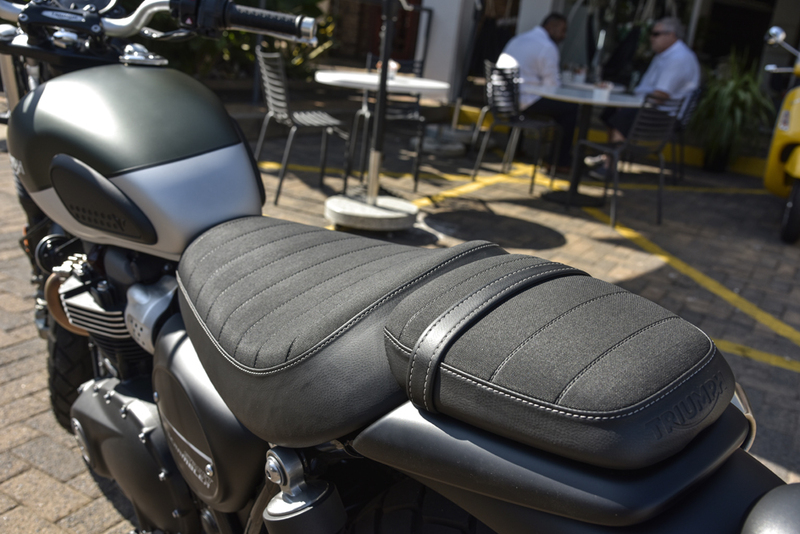 The bike was also really refined and simple, yet engaging to ride. With the passage of time and perhaps inevitably, Triumph have built a real off road weapon in the 1200 Scrambler about to be launched world wide. So what about the Street? 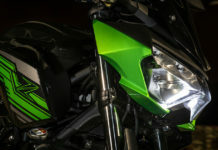 Essentially they have addressed the only two criticisms levelled at the bike. They bumped the power by just on 19% and sharpened the front brake power by bolting on a Brembo calliper. 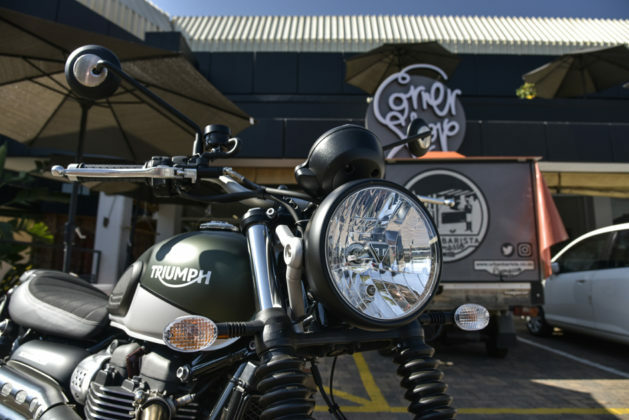 So who should buy a Triumph Street Scrambler?. Well, here’s the thing. Watch the news these days and you feel like doing push ups on your penknife. Eskom, aided and abetted by government, is doing it’s damndest to re-introduce us to “darkest Africa”. We all seem to be putting in more effort for less reward. Richard Dawkins, the atheist intellectual spoke of the Universe as “a cold, bleak and empty” place! Lousy advert for atheism wasn’t he? I reckon he needed two things to alter his world view. 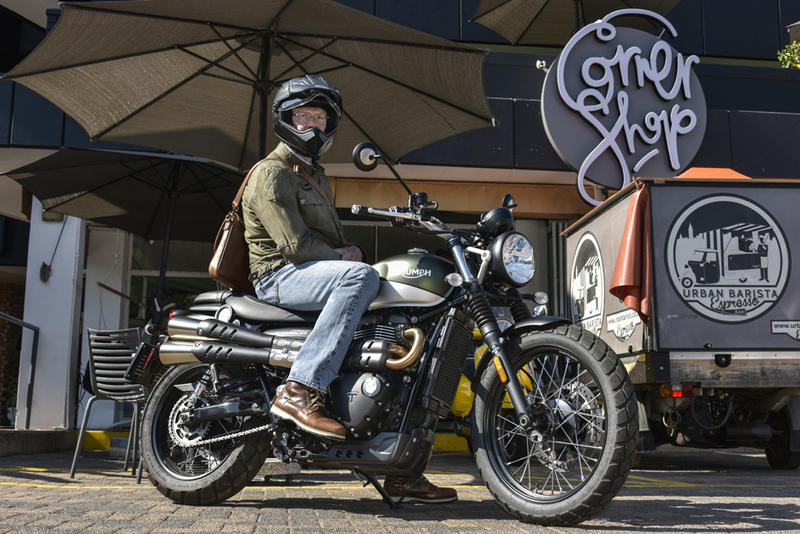 Rethink his atheist stance and buy a Triumph Street Scrambler! The world cannot be a miserable place with a Scramblers muted rumble beneath you. Let’s back peddle a bit. Our relationship with our bikes is essentially twofold. It is a bit like with women actually. First it’s the looks, and then the character is explored. 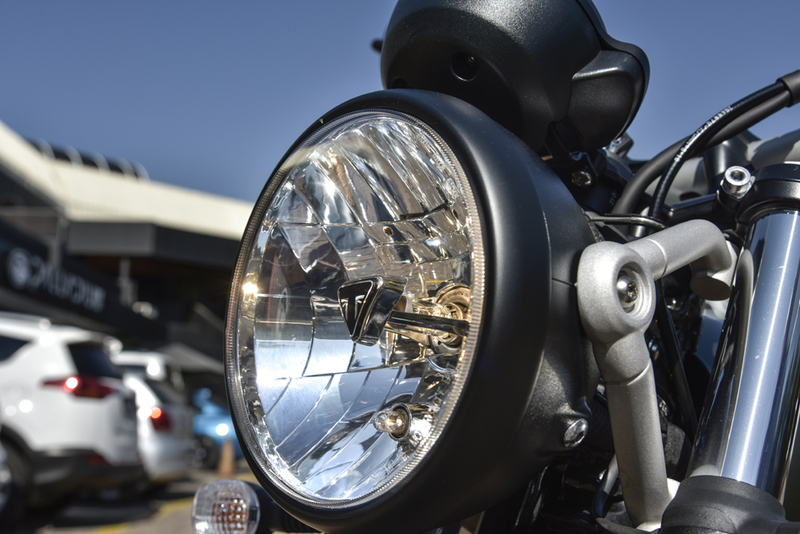 We see a bike and say, “how cool is that beast?”. Now the seed is planted and the imagination takes over. 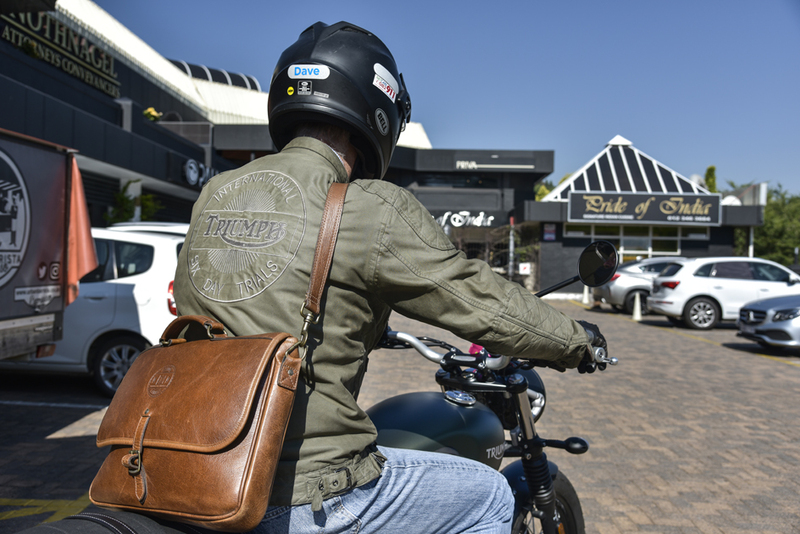 In your minds eye you are riding your favourite road on your new bike and all is well with the world. 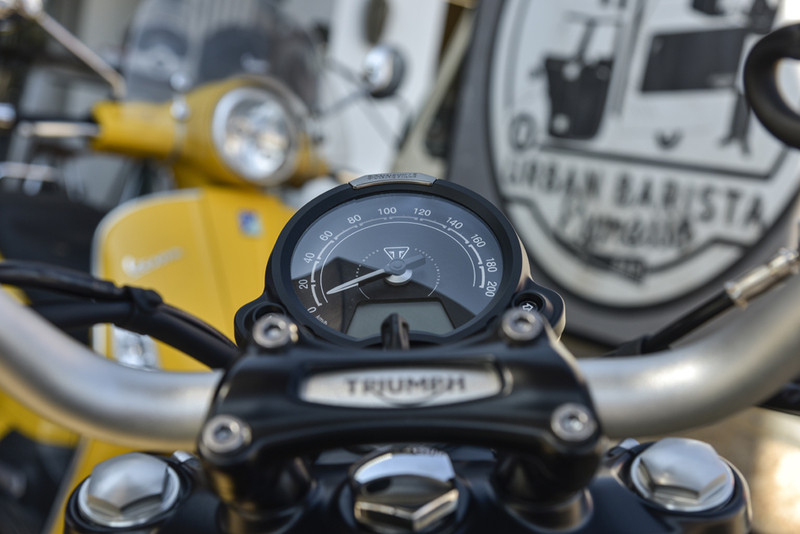 The plot is hatched and your Scrambler is in your garage. 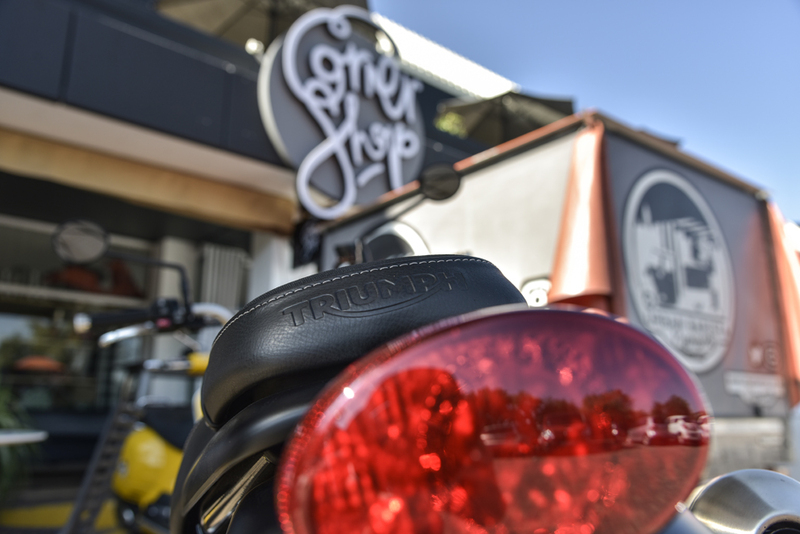 I have been known to sit on a camp stool in my garage, sipping on a coffee and visually feasting on my new bike. You will want to indulge yourself in this manner with your new Scrambler, because it is, to my eye, a stunning looker. 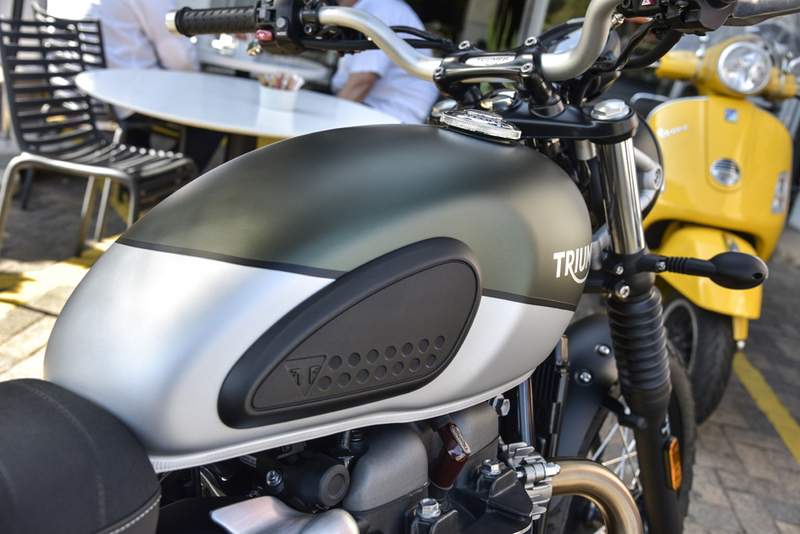 Triumph’s attention to detail on all their bikes is world class. Remove the petrol cap and there, cast into the part that goes into the tank is a little Triumph logo!. Flip, who is going to see that? Wherever you look these little touches abound. The proportions are just right. From the curve of the classic Bonneville tank to the bobbed fenders and the upswept twin pipes, it is oh so right. Classic and simple. Turn the key in the middle of the dash, watch the dash come to life, pull in the clutch and depress the starter incorporated into the “kill” switch and the 270 degree parallel twin 900 fires up instantly, settling into a rumbly idle. 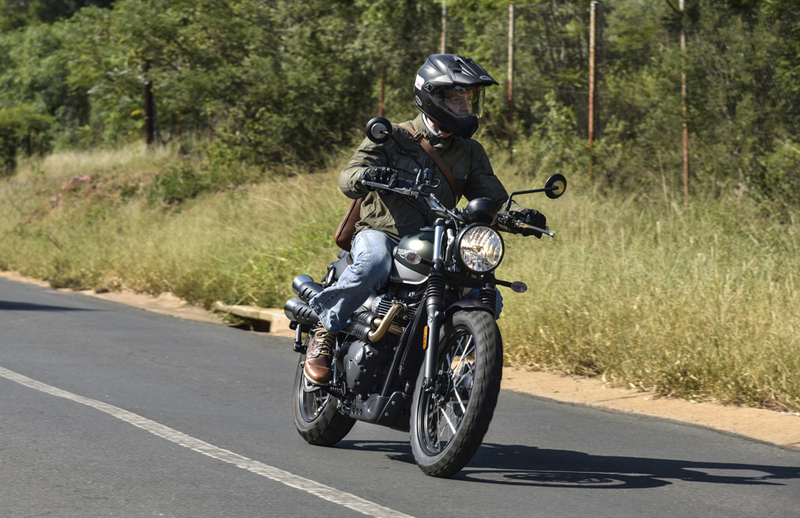 Snick the bike into gear, ease out the buttery smooth and light clutch and a solid wave of torque just punts you off the line. No need to rev this bike. 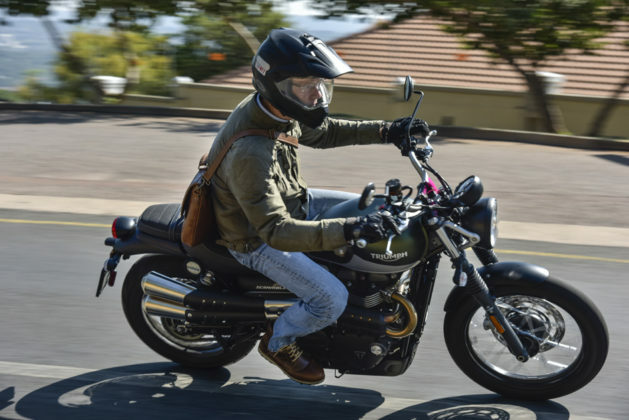 Short shift and let the ample low down grunt power you briskly along. 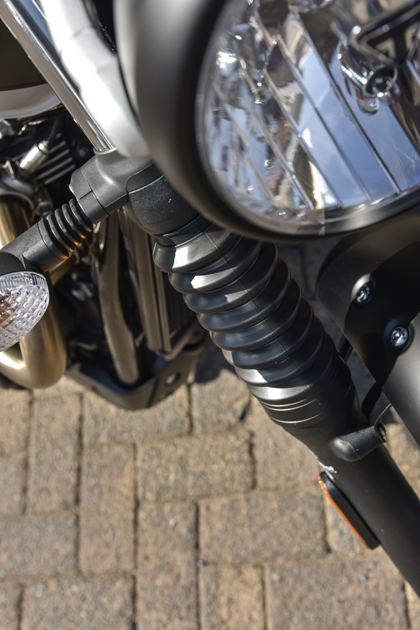 The power increase is immediately evident if you rev the bike through the gears. The “old” bike would pull well to 4500 rpm and then go somewhat dead, not really pulling with any authority to redline at around 7000 rpm. 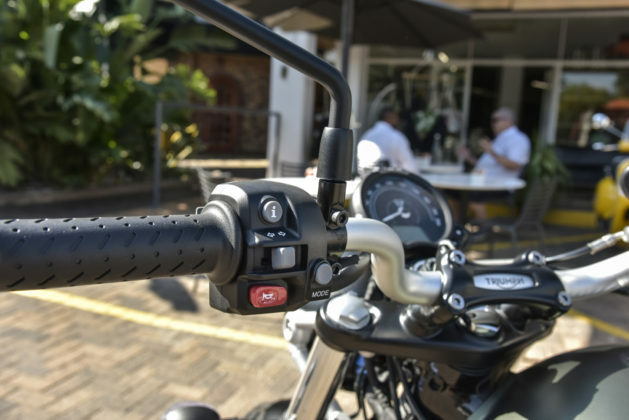 The 2019 bike pulls in a perfectly linear fashion with 500rpm more at the riders disposal. It is at no point intimidating, but rather satisfying and in keeping with the demeanour of the bike. There are five gears. Ample, given the low down urge that this engine revels in. 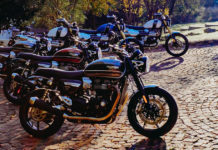 What amazes me is the feel that Triumph manage to build into their Twins. There are a plethora of 270 degree parallel twin engines built by a number of manufacturers these days. 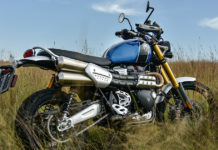 Honda Africa Twin, Kawasaki Versys, Yamaha Super ten and MT 07 and the KTM 790’S to name a few which, whilst capable, none of those bikes have the incredibly sweet engine feel of the Triumph twins. Smooth and kind of velvety. 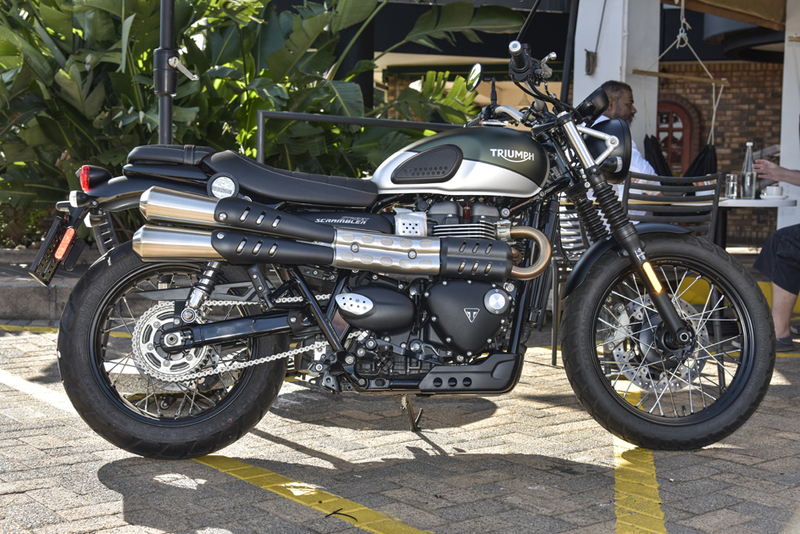 This version of the 900cc twin makes 65 hp @ 7500 rpm and 59 ft lbs of torque at only 3200 rpm. The crank is a tad lighter too. Crazily, the already excellent fuel consumption is even better on the new model. It is quite easy, in around town and short hop commuting, to see the Scrambler sipping fuel at under 4l/100. The forks are wider and cartridges upgraded for even more assured handling. 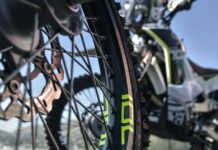 The bike keeps it’s 100/90×19 front and 150/70×17 rear wheel sizes. 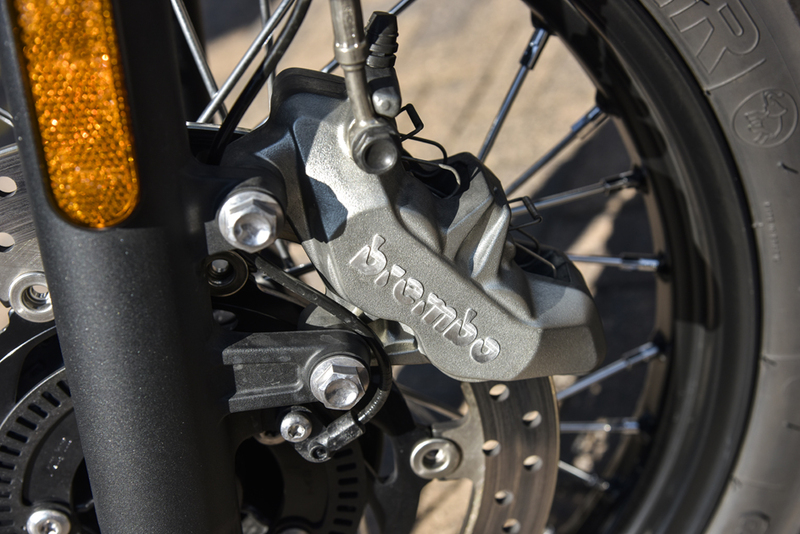 The 310mm front disc is now chomped on by a Brembo calliper, which takes braking from adequate, on the old model, to excellent on the 2019 model. The dash is the epitome of simplicity, with all the information and changes you may wish to make to ABS or engine modes achieved by pushing or holding only one button. Hallelujah! So what we have on the 2019 Street Scrambler is subtle tweaking by Triumph of what was already an excellent motorcycle, to a now close to flawless bike, given it’s intended use and market. It is simply such a pleasant bike to ride. It is the kind of bike that would get me up early on a sunny day to go for a cruise and soak up the absolute pleasure that is motorcycling simplicity and purity. 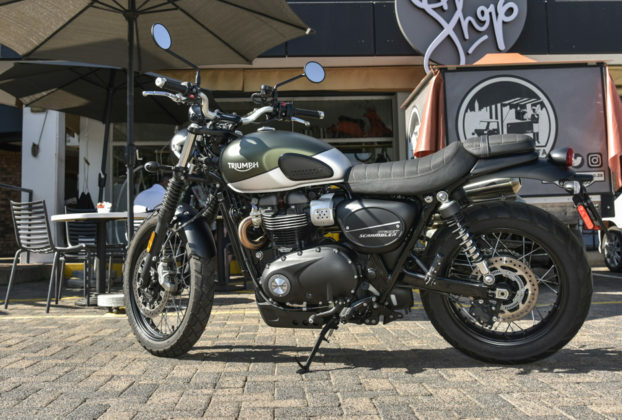 If it were not for the fact that I have a 1200cc XE Triumph Scrambler on order, I would have one of these, which I would ride everywhere, both on and off road. This is a bike for the soul. ‘Nuffsaid!